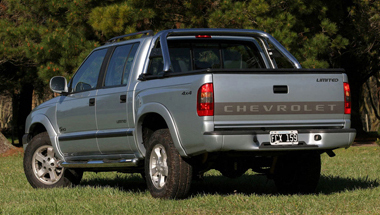 The Chevrolet S-10 is a compact pickup truck from the Chevrolet marque of General Motors. When it was first introduced in 1982, the GMC version was known as the S-15 and later renamed the GMC Sonoma. A high-performance version was released in 1991 and given the name of GMC Syclone. The pickup was also sold by Isuzu as the Hombre from 1996 through 2000. There was also an SUV version, the Chevrolet S-10 Blazer/ GMC S-15 Jimmy. An electric version was leased as a fleet vehicle in 1997 and 1998. Together, these pickups are often referred to as the S-series. In North America, the S-series was replaced by the Chevrolet Colorado, GMC Canyon, and Isuzu i-Series in 2004. The current S-Series remains in production in Brazil. Introduced as a response to the success of Japanese pickups at the start of the 1980s, the Chevrolet S-10 quickly became a prime competitor in the compact pickup truck segment. Affordable and highly configurable, it was an everyman's truck, meeting the needs of anyone who didn't need the towing and payload capacities of a full-size pickup. It was offered in regular, extended and (later on) crew cab bodies with short and long beds. New heavy-duty and off-road suspensions appeared in 1984 along with a hydraulic clutch, while the big news for 1985 was the discontinuing of the Cavailer's 2.0 L OHV I4 in favor of Pontiac's 2.5 L "Iron Duke" OHV I4. The OHV-derived 2.2 L diesel engine and 1.9 L SOHC gas engine, both from Isuzu, were gone the next year, leaving just the Iron Duke and updated 2.8 L V6. A much-welcomed 4.3 L V6 was added for 1988, and anti-lock brakes came the next year. The GMC S-15 became the GMC Sonoma in 1991, and the Sierra trim packages are dropped to avoid confusion with the new GMC Sierra full-size pickup. The 1994-'97 S-10 featured a standard 2.2-liter four-cylinder engine on rear-wheel-drive models that made 118 horsepower. Optional with 2WD and standard with 4WD was a 165-hp 4.3-liter V6. The high-output V6 put out 195 hp. These V6s were upgraded in 1996 to provide more horsepower and torque. Transmission choices included a five-speed manual or a four-speed automatic. Rear antilock brakes were standard, but four-wheel ABS was optional on four-cylinder models and standard with the V6. (All S-10s had four-wheel ABS after 1996.) A driver airbag became available in 1995, but there was no passenger protection until the 1998 update. The S-10 underwent a midlife freshening for '98 that saw more aggressive front styling and an improved interior with dual airbags. 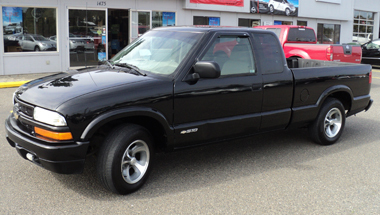 The S-10 Xtreme that debuted in 1999 was the street-oriented counterpart to the ZR2. It was offered only in rear-wheel drive with a 2-inch-lower ride height. It also added a body-color grille and bumpers, full ground effects with wheel flares, the sport suspension and 16-inch aluminum wheels. 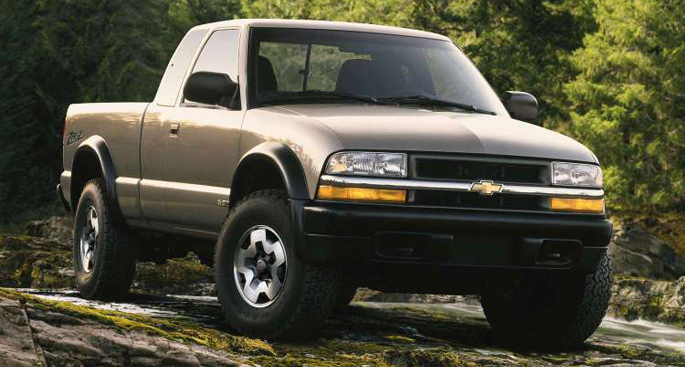 The only other major change for this S-10's run was 2001's new four-door crew cab model with five-passenger capacity, and Chevrolet S-10 Accessories. Radio and heating, and air conditioning controls are large, legible and so easy to use that their respective sections in the owners manual may never be read. For 2002, air conditioning is standard on all S-10s. A cold climate package is also standard on all models sold in northern states. Four-wheel-drive controls are fully electronic, push buttons easily reached on the dash. The S-10 mimics the big Chevy pickups with the horizontal bar grille and nicely rounded contours.